CENTRIFUGE for Liquid Process Analyser "CENTRIFILTER"
OPTA-PERIPH is the original designer (1986) of the BP Lavera Process FTIR system, now used worldwide in a range of different applications. The goal of Opta-Periph has always been to provide to users the refinery analysers and sampling ancillaries range, with the unique expertise in oil upstream and downstream markets for Performance Monitoring and Advance Process Control. - Off line FTIR lab. analyser. - "CENTRIFILTER": a world-wide unique and patented Centrifuge Filter and Dewatering device for Liquid Sample Process Analyser Conditioning. This concept is opening a new sampling conditioning philosophy offering performances beyond any type of conventional filter or coalescer not effective on black or heavy products and requiring continuous maintenance. "SPC" refinery analysers certification floating piston cylinder for hydrocarbon liquid standards with specific application on Ultra Low Sulfur , RVP, Distillation and NIR Chemometric analysis. -Oil manual spot sampling system (oil manual sampler) according to ISO 3170 for refinery liquid products or according to ISO 10 715 for Natural Gas industries (LPG and LNG). -Oil Automatic Sampling system (oil autosampler) dedicated to the refinery upstream market (Crude-oil automatic sampling system (crude autosampler)) or to refinery gasoline/diesel-oil blending tank quality tracking . 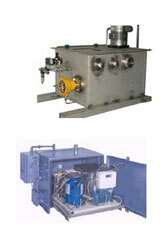 - Natural Gas (LPG) automatic sampling system (LPG autosampler) according to ISO 10 715. In addition , OPTA-PERIPH developed a range of Oil in Water monitors for oil tank dewatering autocontrol with a specific application on desalter processing. A range of Electrolytic Gas Moisture Monitors with P2O5 sensors dedicated to pure gases with special applications for moisture measurement in chlorine gas or moisture calibration system (H2O generator) complete the product line. The other part of OPTA-PERIPH's activity is related to the 94/09/CE ATEX safety compliance of electrical enclosures in explosive area and inert gas blanketing tanks , centrifuges and reactors for petrochemical, chemical and pharmaceutical industries. On purpose , OPTA-PERIPH developed Purge and Pressurization Monitors as well as blanketing control valves ATEX CE Type certified and the OPTA-PERIPH production quality system has been certified . OPTA-PERIPH has additionally developed a customised activity to offer ATEX certification for complete user turn-key systems mainly ATEX certified Air Conditioner (HVAC) and water chillers for zone 1 and 2. To ensure that our customers are provided with a complete analytical solution OPTA-PERIPH can also specify and supply all necessary ancillary products and services. These include the components making up the sample loop i.e. sample probes, sample transport components, sample conditioners and enclosures or analyser shelters. OPTA-PERIPH also offers a complete after sales support package, which includes installation, commissioning, service and routine maintenance, as well as site surveys and training on the OPTA-PERIPH products and systems. OPTA-PERIPH manages all aspects of site work for analysers and systems supplied. From initial delivery of the equipment to site, installation to agreed standards, and final commissioning, OPTA-PERIPH will manage the project. During the guarantee period provided on site service, and beyond that time OPTA-PERIPH can provide quality contract maintenance. We undertake site quality surveys, advise on replacement of old equipment, suitable locations for new products, locating sensors for plant safety. If you have any queries about specific applications, or need guidance on the type of analysers you should use to solve a specific problem then contact us. OPTA-PERIPH realises that in these times of increased legislation, customers are under increased pressure to comply – OPTA-PERIPH would be happy to assist you with minimising these problems. The support offered by OPTA-PERIPH will range from simple guidance on how to deal with an application problem, to assisting with feasibility studies (see also site surveys) and provision of detailed quotations for solving the most complex of problems. With many years experience in all aspects of the safety industry OPTA-PERIPH is happy to assist clients on legislative detail, compliance with local statutes and any other product-related safety matters. Why not contact OPTA-PERIPH today with the details of your problem and see what practical safety solutions OPTA-PERIPH can provide. Having made the necessary financial investment to solve your measurement problem, the last thing you want is not to operate it at optimum efficiency. At OPTA-PERIPH we appreciate the need for effective training of plant personnel in the operation and maintenance of equipment, and OPTA-PERIPH places particular emphasis on providing this. In addition to commitment to offer products of the highest quality, OPTA-PERIPH also devotes considerable resource to ensuring that all our support services are equally good. These services are geared to helping OPTA-PERIPH customers achieve the best solution in the quickest time, with minimum downtime.